Fizzy & Effervescent: The fragrance has a vibrant and radiant top note that infuses freshness and vitality. The joy and colour of the tart sparkling lemon are enveloped by the green crispy freshness of raspberry leaves. Sparkling Light-Heartedness: The middle notes of the fragrance capture the charm and spontaneity of Spring floral Bouquets with a unique combination of tender May Rose and sweet Parma Violet interlaced with hints of a shining Magnolia. The Lotus flower makes this floral bouquet exceptionally fresh, like a light and transparent veil weaved with delicate intricacy-a sweet addiction. Irony & colour return to the new Moshino Cheap & Chic Collection. Bright, strong colours, a sign of intense emotions and passionate enthusiasm for life. The bright pink top is vibrant against the intense yellow glass base and bright Spring flowers on the bottle. 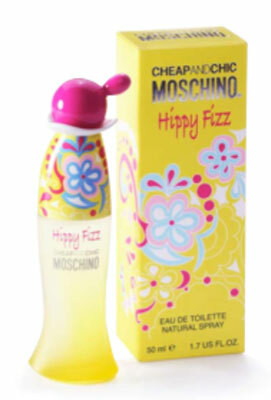 Everything about Happy Fizz infuses lightheartedness, joy, exuberance and vitality.